We have some very exciting news for lovers of Easter egg hunts, Easter eggs and well, just chocolate! 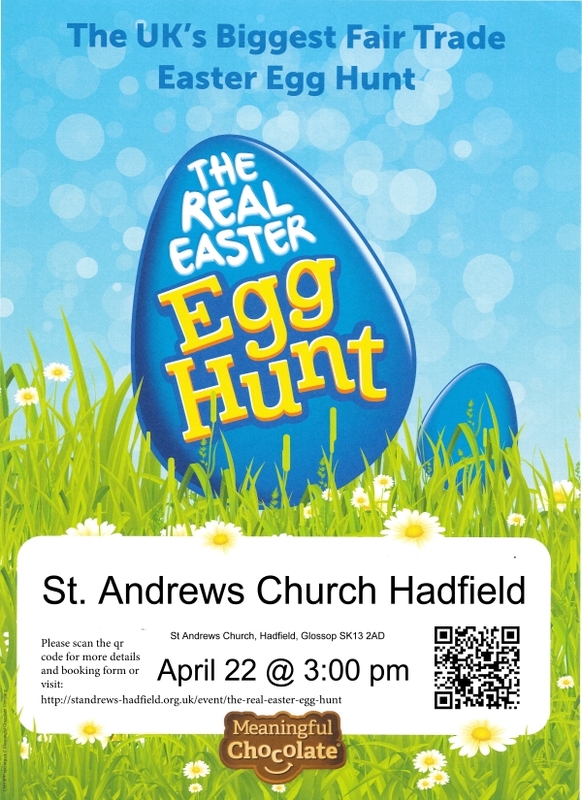 St. Andrew’s Church Hadfield is hosting an Easter egg hunt on Monday 22nd April, starting at 3pm and finishing at 4.30pm. The suggested age range for children that would like to take part is 4-11, but anyone and everyone is welcome. There will be the opportunity to do some Easter-related craft, and you are welcome to join us after the hunt for tea and cake (or even Easter eggs!) . This event is an opportunity to reconnect with what Easter is really all about – Jesus Christ dying on a cross to save us from our sins and rising again – defeating death and giving us new life! The suggested donation for the event is £2 per child. This is purely to cover costs. It would be really helpful to have an accurate idea of numbers, so please use the below booking form or contact Chris on 07889257922.